“To meet the recognised the need for a dedicated creative training and workspace facility in the county Creative Spark, Louth Creative Community Hub has been developed with a focus on the development of the creative enterprise sector in this region and the use of creative practice to promote social engagement. Our project is about popularize Creative Spark, we had four times meeting about how we popularizing Creative Spark, and we discussed our project design. First, we confirmed our object is 16 – 60 years old people who are interested in creative media. 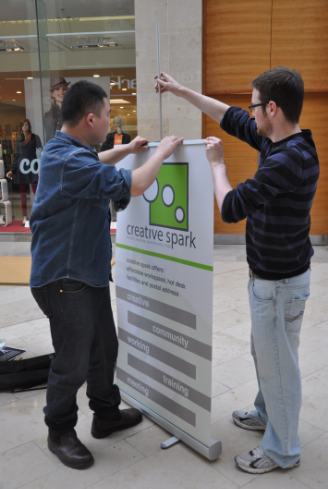 Second we chose passing out business cards to people as our project design for popularize Creative Spark. 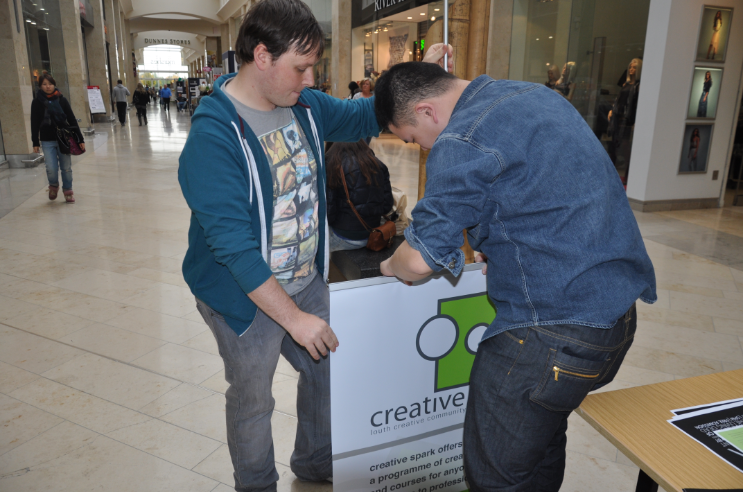 Third, we selected Marshes Shopping Centre as the place for passing out business cards. Then, Andrew designed the content of business card and poster for our popularize. 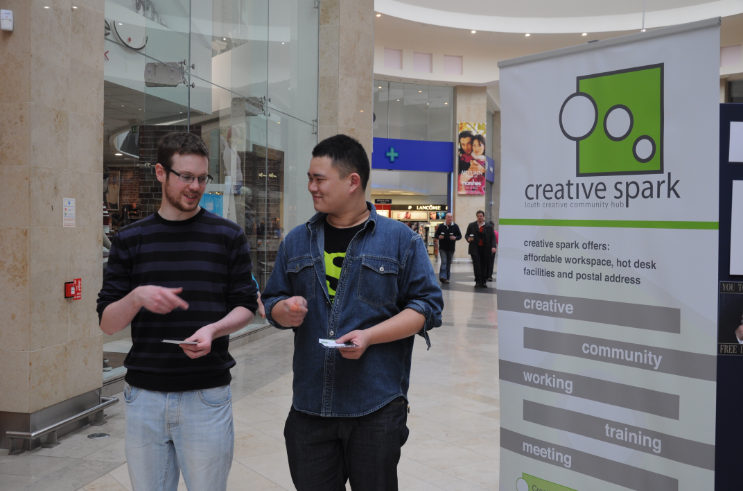 19 Oct 2012, we go to Marshes Shopping Centre to pass out business cards. It is the first time for everybody in our group to pass out something in public. At the beginning, we all did not know what to do and we were a little bit shy. After about 10 minutes, we didn’t pass out even one business card to people. At that time, I came up with an idea. I went to a shop and got 2 boxes of lollipops, and then I told my group maters that we could give the people lollipops to make them stop and listen to our introduction of Creative Spark. This method did be effective, because there were a lot of parents walk in the shopping centre with their children. Kids love lollipops so much! As a result, the parents would stop and listen to introduction when I give their kids lollipops. 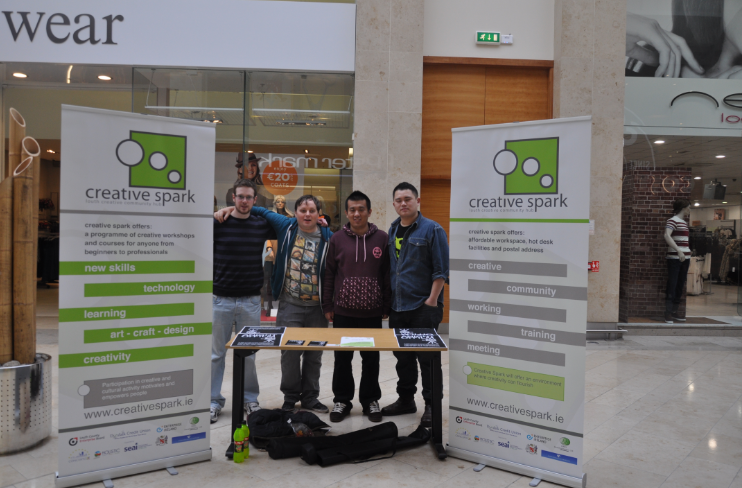 We spend 3hours on this job, and we passed out more than 100 cards, and introduced Creative Spark to more than 60 people. Here is some information we introduce. All packages including membership of Spark Plugs Social Club a monthly networking and learning get-together. Meeting rooms are available to hire fully equipped with AV equipment. Preferential rates and all-inclusive packages available for tenants. A self-service tea and coffee-making facility with comfortable seating for informal meetings is available in the central circulation space. Training space will be available to rent by individuals delivering training in creative media or related business topics. Training space will be used by Creative Spark to deliver targeted specific training meeting the needs of the tenants and community groups. All packages include membership of Spark Plugs Social Club a monthly networking and learning get-together. And we told people 23 Oct 2012 is Open Day for Creative Spark, they could come and see some project from Film and Creative Media student in DKIT. At the beginning, we were preparing for the work. We were passing out business cards. 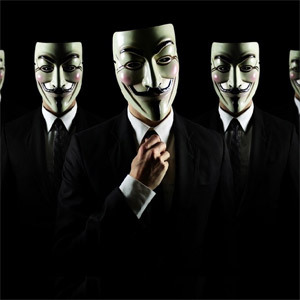 Personally I am not interested in this type of organization like groups Anonymous and Lulzsec. And I think it can be used for good but can also be used for bad. People are able to know the truth from them. Also, People will be misleading from them. “WikiLeaks is an international, online, self-described not-for-profit organisation that publishes submissions of private, secret, and classified media from anonymous news sources, news leaks, and whistleblowers. I don’t know that I could be convinced to become politically active through targeted social media or not, I would think, if a good thing, I do, if not, I will not do. I use facebook and twitter, But this is only because the some thing of college, I need use those to communication with classmates, I don’t want to leave too much information about me in facebook and twitter. My presentation online is very short, it only enough people who know me can find me in the internet, Doesn’t contain my hobbies, personality or other. “Due to the obvious divide set between digital natives and digital immigrants, sometimes both generations are forced to meet which commonly results in conflicting ideologies of digital technology. The everyday regime of worklife is becoming more technologically advanced with improved computers in offices, more complicated machinery in industry etc. With technology moving so fast it is hard for digital immigrants to keep up. This creates conflicts among older supervisors and managers with the increasingly younger workforce. Similarly, parents clash with their children at home over gaming, texting, YouTube, Facebook and other Internet technology issues. 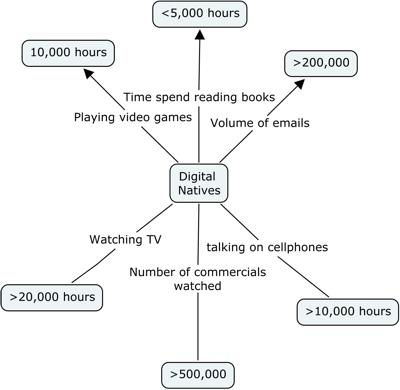 What many digital immigrants miss is that digital natives grew up with technology and it is how they connect with their friends, perform research, and feel at home. Young people are not “addicts” or “bad” simply for using the tools of the world they grow up in. I think presentation online have two side, the employer may find and follow you in the facebook and twitter, maybe they will have interest in some of your hobbies and skills, also maybe they don’t like the current living conditions of you. My point of view, the moral panics that have emerged around living in a networked public, it because people are feeling being monitored, and sometimes people don’t believe some information from the internet. The forming of relationships online may facebook, MSN, Twitter and so on. 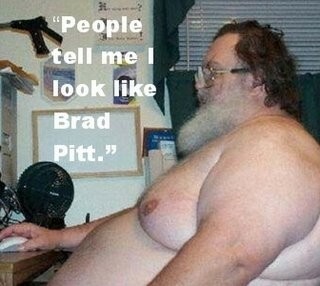 The Internet provides the opportunity for misrepresentation. Particularly in the early stages of a relationship when commitment is low, for example growing number of people on “mainstream dating sites” were married or in a relationship but posing as singles in order to start an affair. in the online world, there is no images and sound judgment, it’s difficult to measure the emotions and feelings of people, it is easy according to their own ideas to shape identity and personality. Internet dating is becoming so common that is it having a noticeable effect on our culture at large. Although most of this effect has been a positive, one area of concern for many is the effect that internet relationships are having on existing relationships. Internet infidelity is relatively easy to hide and easy to proliferate given the asynchronous manner of e-mail communication. I does not think the possibility for deception naturally increase in an online setting, in China, in somewhere from internet, we need use Blog Real Name System, you need your ID to register account. I think it can reduce deception. And I think that online deception is a personal act, just like in the real world of deception. – The process of communicating and building relationships online is different than offline. It takes a bit longer for deep connections to form but faster for weak connection to form and there is what I call digital body language instead of physical body language and it takes a while to understand and identify. – Online, you may still not get the whole picture of someone because they they can still be relatively anonymous and you see them in a very discrete context whereas offline you are more likely to run into them in the grocery store, etc. In many other respects, they are the same. “Facebook has affected the social life and activity of people in various ways. With its availability on many mobile devices, Facebook allows users to continuously stay in touch with friends, relatives and other acquaintances wherever they are in the world, as long as there is access to the Internet. It can also unite people with common interests and/or beliefs through groups and other pages, and has been known to reunite lost family members and friends because of the widespread reach of its network. One such reunion was between John Watson and the daughter he had been seeking for 20 years. They met after Watson found her Facebook profile. Another father-daughter reunion was between Tony Macnauton and Frances Simpson, who had not seen each other for nearly 48 years. My point of view, Online and Offline Communities are mixed nowadays. Social reality that people often use the online contact, friends in the network there are also some offline contact. Hanging around online to teenagers, I think most of teenagers spend more than 3 hours hanging around online, in most cases, young people use online chat, read news, play games. 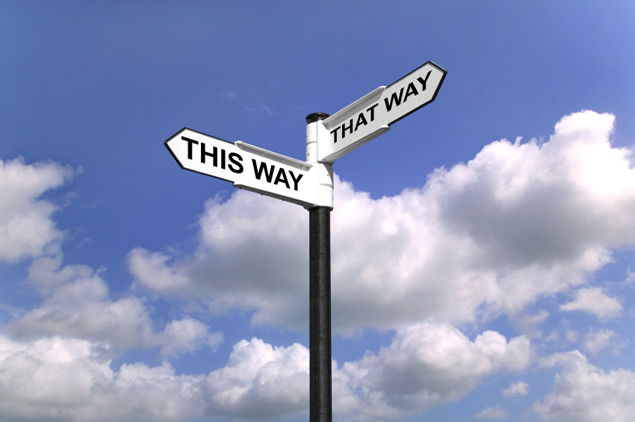 Nowadays, if the young people to leave the network, perhaps they will not to know what to do. For myself, I think hanging around online is a rapier, benefit is more fast and convenient contact with people, and more fast and convenient get news. Disadvantage is big waste of time to some not necessary and meaningful things. “Fandom (a portmanteau of fan [fanatic] and the suffix -dom [domain], as in kingdom, freedom, etc.) is a term used to refer to a subculture composed of fans characterized by a feeling of sympathy and camaraderie with others who share a common interest. Fans typically are interested in even minor details of the object(s) of their fandom and spend a significant portion of their time and energy involved with their interest, often as a part of a social network with particular practices (a fandom); this is what differentiates “fannish” (fandom-affiliated) fans from those with only a casual interest. Fans have become important to work in media sociology and cultural studies for a variety of reasons: they can be taken to represent a dedicated, active audience; they are consumers who are often also media producers; and they can be analyzed as a significant part of contemporary consumer culture. In my opinion, the Internet has helped greatly in the Fan culture. We can see, many people have many fans in facebook and twitter, whether politicians, celebrities, singers or writers. Different fans have different cultural, for example, football fans, the fans of each team has its own spirit of a cultural, favorite colors, team song and so on. About Fan activity as a remix, I would say this activity contribute to the culture, a film called The Avengers, it can mix different fans together, It help to share different Fans culture. 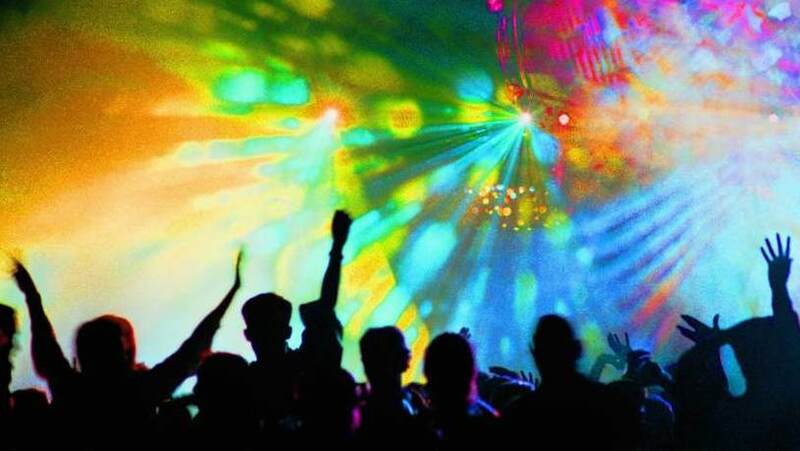 Beer, Drugs and Dancing are essential in Britian rave scene. And people wear diffierent and colorful. Only problem is security issue, when people drunk or drugs, if we leave this two things, I think Rave scene in Britain have a positive impact on, because it can people give vent to their emotions, relieve the pressures of modern society.